State and Territory Ministers and members from the Coalition of Peaks at the first Joint Council meeting. On 27 March, I represented the ACT Government at a historic meeting – the inaugural Joint Council on Closing the Gap. 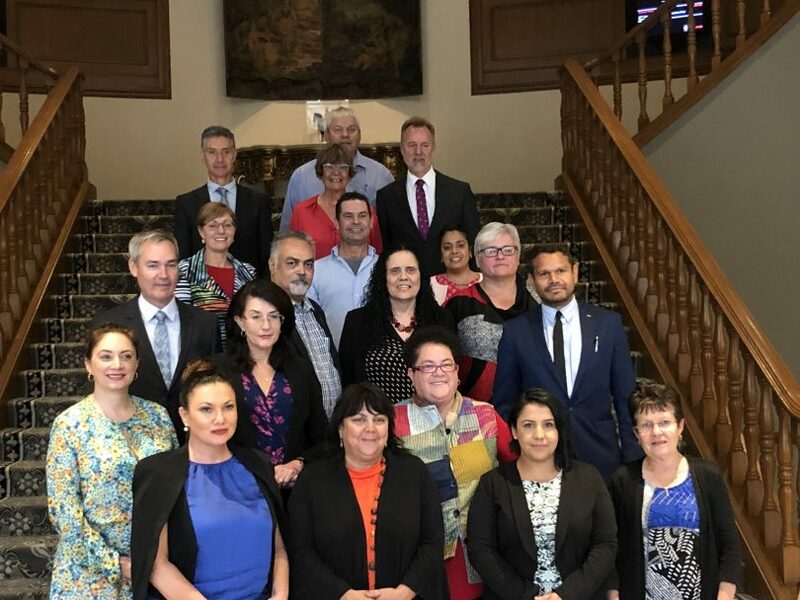 It was the first time a COAG Ministerial Council meeting has been convened with Aboriginal and Torres Strait Islander organisations at the table as equal partners in decision making. The Joint Council was established under a Partnership Agreement signed by the Commonwealth, State and Territory Governments, the Australian Local Government Association and the Coalition of Aboriginal and Torres Strait Islander Peak Organisations. The ACT Chief Minister was the first state or territory leader to sign this ground-breaking agreement, which will fundamentally change how governments work with the Aboriginal and Torres Strait Islander people to Close the Gap. We know that Aboriginal and Torres Strait Islander people have the answers, and the ACT Government had previously expressed concern that their voices were not being heard in the Closing the Gap refresh process. We have welcomed the Coalition of Peaks’ advocacy to turn that around. Governments at all levels have accepted that our country will not be able to overcome the legacy and lasting effects of colonisation without accepting and giving effect to the principle of self-determination. If we want to continue our journey towards true reconciliation, we need to empower Aboriginal and Torres Strait Islander people, the experts in their own lives, to share in the decision making that impacts them directly. Since 2008, the ACT has been the only Australian jurisdiction to have an Aboriginal and Torres Strait Islander Elected Body, providing a direct voice for Aboriginal and Torres Strait Islander people to the ACT Government and the Legislative Assembly. Members are democratically elected by Canberra’s Aboriginal and Torres Strait Islander community and work with the ACT Government to develop policies to meet the needs of Aboriginal and Torres Strait Islander people. They also hold the Government to account through an annual estimates-style hearings process and report, as well as in regular meetings with Directors General and Cabinet. Through this partnership, we are moving beyond consultation to co-designing policies and initiatives with the Aboriginal and Torres Strait Islander community to make real change. On 26 February, the Chief Minister and I signed a ten-year Agreement with the Elected Body Chair, Katrina Fanning, setting out our commitment to working with Aboriginal and Torres Strait Islander people and organisations to deliver equitable social, cultural and economic outcomes across ten focus areas. For each focus area, we’ve developed a detailed Action Plan, setting out how we will work together, measurable targets and priority actions. Most importantly, the Agreement and Action Plans were developed and driven by the Elected Body to reflect the priorities and concerns of Canberra’s Aboriginal and Torres Strait Islander community. The Elected Body made it very clear that the Agreement would not be signed unless these Action Plans contained meaningful initiatives that would result in real change for their community. Supporting the development of Aboriginal and Torres Strait Islander-managed community housing in the ACT. Through the Agreement, we are recommitting ourselves to self-determination. For the traditional custodians of this land, embarking on a Treaty process with Government is arguably the ultimate expression of self-determination. From my conversations with Ngunnawal people, I know that Treaty is an important issue for many. We have therefore committed, under the Cultural Integrity Action Plan, to working with traditional owners to hear their thoughts on Treaty and support a joint understanding of the opportunity for, and implications of a Treaty process for the ACT. These conversations began last year and are occurring at a time when Canberra will be hosting the National NAIDOC Awards Ceremony, the theme being ‘Voice. Treaty. Truth. Let’s work together for a shared future’. The ACT is unique in having a voice to Parliament. We are unique in having a public holiday for truth-telling – the very purpose and value of Reconciliation Day. And we strongly support Federal Labor’s commitment to national action on the Uluru Statement from the Heart. I look forward to welcoming Aboriginal and Torres Strait Islander people from around Australia in NAIDOC Week and continuing these important local and national conversations. To learn more about the ACT Aboriginal and Torres Strait Islander Agreement 2019 – 2028 and Action Plans, click here. Rachel Stephen-Smith MLA is the ACT Minister for Aboriginal and Torres Strait Islander Affairs. Why are we removing so many local Aboriginal kids from their families?